We enter through the famous Buland Darwaza or ‘Gate of Magnificence’—said to be the highest gateway in Asia—into the courtyard of a magnificent mosque, the Jama Masjid. Also in the courtyard stands the exquisite marble tomb of Saint Shaikh Salim Chisti who died in 1572. Such is his fame that pilgrims travel from far and wide to seek his blessings. The original tomb made by Akbar was in red sandstone, but was changed to white marble by his son Jahangir. The intricate carving and the lattice work of the wall surrounding the tomb are considered among the best examples of marble carving in the world. Sitting on the steps of the tomb of the Saint and listening to a song in his praise, is a magical experience. For visitors I believe this is the best way to begin a tour of Emperor Akbar’s dream city—Fatehpur Sikri. After all, this amazing city was built because of the fulfillment of a prophecy that the Saint had made to the Emperor. By the time Akbar had been on the throne for 12 years, despite his fast-expanding empire, he was beginning to despair of ever having a son to succeed him. Saint Shaikh Salim Chisti at Sikri, to whom he made a pilgrimage, predicted that he would soon have not one, but three sons! And so it came to pass—the next year the saint's prophecy came true, and his wife gave birth to a son. Akbar’s joy knew no bounds, and he named his first-born Salim, after the Saint. Thereafter two other sons, Murad and Daniyal were also born. The elated Emperor decided that in honour of the Saint, he would shift his capital to Sikri and set to work on creating his dream city in 1571. 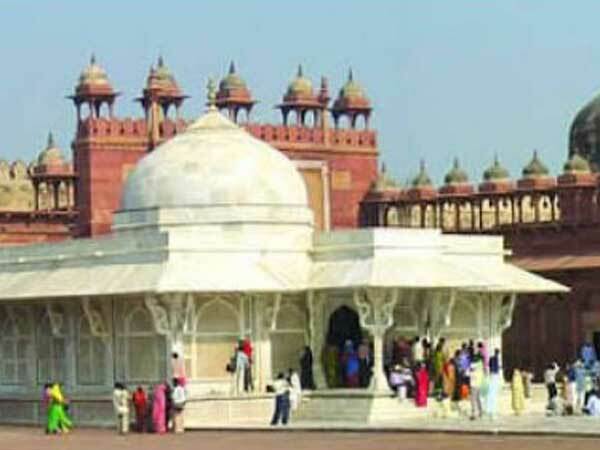 Akbar having just fought and won some major victories, named his new capital ‘Fatehpur Sikri’ or the ‘City of Victory’. This city soon became the administrative and cultural centre of his empire, while his fort at Agra, remained the military stronghold. The Agra Fort, which Akbar had built a decade before, is one of the largest riverside forts in the sub continent. Built on the banks of the River Jamuna, it is quite different from the traditional hill-top forts of India. Its massive walls and ramparts, and a deep moat, ensured that the fort was impregnable from the outside, while inside, the red sandstone buildings were large enough to accommodate a whole army at the time of a siege. History tells that Akbar, crowned on February 14, 1556 at the young age of 14 years, was virtually illiterate. Despite this however, he is widely considered the greatest of the Mughals, and responsible for laying a strong foundation for his descendents to build upon and create one India's greatest Dynasties. Akbar's half a century of rule, provided a leadership that was an inspiration to all the Mughal Emperors who came after him. His son Jahangir and grandson Shah Jahan, were particularly influenced by his powerful personality. Besides being hailed as a soldier of genius and daring, Akbar was an empire builder, who created a foothold in India strong enough to control of the whole of Hindustan. He was also known for his diplomacy which brought him support from the martial Rajputs. A true liberal, Akbar created his own type of religion that he referred to as the religion of God and named it ‘Din-i-Ilahi’. An amalgam of Hindu, Muslim, Sikh and Christian thoughts, Akbar’s new religion was based on a sort of mystical liberalism. Unfortunately this unique religion died with the Emperor. Fatehpur Sikri, turned out to be unique in many ways. Built in Akbar's favourite red sandstone, it covered a circumference of 6 miles with high walls on three sides and an artificial lake on the fourth. The city soon became a centre of intellectual exchange and learning, where Akbar’s patronage of the arts reached its zenith. Akbar who remained an almost illiterate man, had an insatiable thirst for knowledge. Encouraging all the arts, the Emperor’s coterie included singers, musicians, poets and painters. His nine ministers, commonly referred to as his ‘Nav Ratan’ or ‘Nine Jewels’ ,included people of wit, aesthetics and daring. Now as we walk through Akbar's deserted ghost city, it is easy to imagine the famous singer Tansen performing his immortal ragas for the Emperor at the ‘Anup Talao’ sitting on a seat specially created for him in the midst of a lotus pond. Also not to missed is the ‘Pachisi Court’, where Akbar is said to have played this ancient game (commonly known as Ludo) with the ladies from his entourage, as pieces. At Fatehpur Sikri, the palaces and other buildings used by the Emperor and his queens are all of red sandstone carved in a combination of Hindu and Persian styles of architecture. Particularly charming is the Turkish Sultana’s Palace that stands close to the Anup Talao. With carvings that have a Persian touch are the exquisitely carved friezes of fruit and flowering trees. For some inexplicable reason, Akbar abandoned Fatehpur Sikri after only fourteen years. Perhaps it was because Saint Salim Chisti was no longer around, or it may have been because of lack of water. Whatever the reason, Fatehpur Sikri remains a wonderfully preserved ghost city, where history seems to come alive as one wanders through the palaces, visualising the Emperor holding court in his exquisite Dream City.